I just finished reading The Making of a Chef: Mastering Heat at the Culinary Institute of America, by Michael Ruhlman and while it was interesting, it made me realize a couple of things. One is, I’m glad that I’m not a chef. It’s a hard life. I can barely take the stress of preparing three meals a day for two people, let alone service for tens or even hundreds. The second thing is, I could never go to the Culinary Institute of America. It should be called The Bloody Animal Carcass Institute of America (though the book covers a period back in the 1990s, so things may have changed there). There is brief mention in the book of a class (one class mind you, not a full course) on vegetarianism, and it takes place in a basement room towards the end of one’s education at the Institute. Sounds pretty half-arsed and halfhearted to me. However, I did glean something delicious from the book. The author describes a menu at one of the restaurants (where students do the cooking as part of their education) which included a wild rice salad with toasted pecan dressing. Sounded like a nice title for a recipe. I put down the book and jotted down some ideas. The result is this no-oil, animal-free salad. No butchering required. Salad doesn’t have to mean greens. This easy wild rice salad is bursting with complex flavors and textures. Add the salad ingredients and gently toss to combine. Let salad sit for a little while for flavors to meld – then serve at room temperature on a bed of fresh, crisp greens – sprinkled with additional toasted pecans, if desired. Looks lovely. And I agree about CIA, although I suppose they might have made some changes more recently. My understanding is that the leaders in culinary education are all still pretty wedded to traditional French cuisine as the core of the program, which means a lot of butchering I guess. Somehow the market vegetables and portion sizes of the French plate don’t seem to permeate American culture as well as the meat and meat related techiques. I found the attention to sauces in the curriculum really interesting – so French – and so far removed from the way that I cook! I suppose the idea is that one has an excellent, solid base for working in a variety of kitchens. An fascinating read, but again, I’m glad I’m just a “home” cook! Thank you for sharing! It holds up quite well, too. 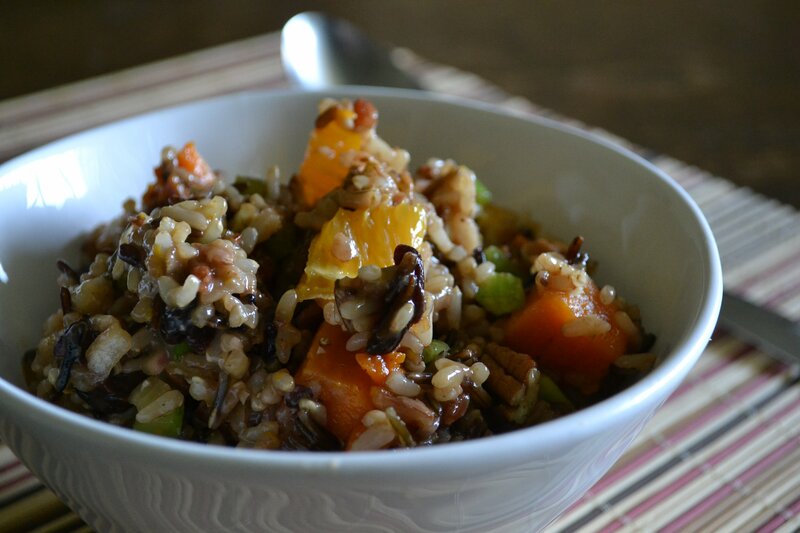 I just love the combo of nuts and wild rice – with a little tart-sweetness. I appreciate the comment! Haha! I’d love to, Barb!! But only if you send me some of yours! Thanks, Shira! The book was fascinating in so many ways, but wow..a guaranteed stressful job when one graduates! And the heat! And not being outside! And the long hours! Okay, I’ll stop there ;-). I think some of the top vegetarian/vegan chefs should start their own culinary institute! Thanks for another delightfully delicious recipe, Annie! Hey, lady! Have you recovered? Been thinking about you. Ugh. Throat is almost better, as is the hamstring. No hills for me for a while! Thanks for the good thoughts! And for the VVP. I love it and can’t wait for VVP2! Glad to hear you are on the mend. FYI VVP now has its own Facebook page: https://www.facebook.com/VirtualVeganPotluck Yay! Ha ha! I just packed away my cookbook from the CIA last night! – and others too, not sure whether to donate them or glean them for bits here and there, and make a new database out of the salvageable recipes. My cookbook shelf in my kitchen doesn’t have any room for my non-plant based books anymore! I read Julia Child’s “My Life in France” last year. It was really lovely, but I think I would have a hard time re-reading it now. Aspic, butter EVERYWHERE, boeuf bourguignon, all kinds of fish with the head left on. I mean the lady was an AMAZING cook, but I don’t think that there was a single dish that she discussed that wasn’t drowning in cream or meat. What’s even more interesting is how much discussion went on in the book about how often they got sick they got from all the glutinous eating. They would literally be down for weeks on end after feeding their bodies that way. She discusses how badly it affected their liver, their bowels and more. Crazy that one could keep eating like that when it made them so ill.
It’s so fun to have a new paradigm where things can taste crazy delicious WITHOUT added evils that will make us sick and eventually kill us. Anyway…. Lovely salad Annie! I make 95% of my dressings without oil now, and when I do use it now it’s just a drizzle rather than the gobs usually called for in recipes. It’s so fun to read your blog everyday and get inspiration! Somer, I read that Julia Child book, too, long ago. I loved it – she was so charming. But you are right: ugh!! The heavy, heavy food. And so labor intensive. I have tons of cookbooks I no longer even reference. What to do with them?? It’s hard to part with them even though they have little meaning anymore in my life. Thank you! It makes a really light but filling side. I couldn’t agree more! Most of my salads sneak in a little something sweet and a little something crunchy. Thank you, my far-flung friend! Beautiful salad. I love incorporating sweet dried fruits into savoury dishes! Oh gosh, that’s a great point! The kitchen is my “happy” place, too. Imagine cheffing all day and coming home and making dinner – hehe. No thanks! http://tabkhetelyom.com/ Hi I nominated you for an award. Wow! Thank you so much! I’m honored. And thank you for following my blog – I really appreciate it. I’m loving the combination of ingredients! The cherries sound like a unique addition. Yum! But I find it hard to get that sort of cherry here in Oz. Any ideas for a good substitution? I was thinking cumquats, chopped into small pieces. Sweet on the outside and tart in the middle. I don’t suppose you can get dried cranberries?? But really, your solution sounds just right – you’re looking for that tart-sweet bite! YUM. Every time I think you’ve outcooked yourself, you do it again. You’re killing me! Thank you, dear! Yum! This looks and sounds delicious!! Must try!! Looks so good!!!! And healthy!!! And delicious!!!! I love sweet potatoes with a passion but I never thought of combining them with rice, clever! An amazing salad as always Annie. Love that you’ve used wild rice… I love it. More so because of all the different textures and flavours going on there. I love wild rice, too, and should use it more often. Thanks, Averil!